I started cycling to work about four weeks ago. Yes. I took the plunge and became a “London cyclist”. Cost was the first thing putting me off. I considered a dodgy Portobello road market £50 bike, or a more ligit second hand one for about £100 from Camden cycles. Then pondered whether it’s worth spending that much when the bottom end new bikes (e.g. halfords or decathlon) start at about £150. Then I realised that the bike is only part of the cost. There’s the padlock, lights, hi-vis clothes, and helmet to buy. So does this mean I might as well spend a bit more on the bike? I probably would have ummed and ahhhed about that forever, but then I found an old cobweb-covered brown bike in Grandma’s garage. Problem solved! Death, and the danger of it. 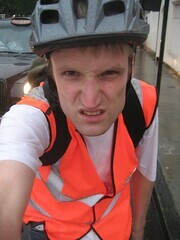 I always perceived cycling London streets to be quite a dangerous undertaking. I think most people do. I’m cautiously learning how to do it, having only ever cycled on the hilly country roads of Holmfirth half a lifetime ago. I now have a more first-hand appreciation of cyclestreets.net and their very nifty display of three levels of cycling routes: quietest, fastest and balanced (try it!) My journey to work has plenty of options, and I can mostly stick to quiet roads, but in fact that’s probably true of most London journeys. I was nervous about crossing big junctions like on Holloway Road here, but actually traffic lights usually allow a little rest, and then saftey in numbers as a whole flock of cyclists make the same crossing. Meanwhile more minor junctions like at Offord Road have yielded my closest encounters of a near-collision kind. I haven’t died yet, and on the whole it feels a lot safer than I was expecting. Plus the exercise will be doing my life-expectancy some good. Oily Brokenness. So far I’ve had none of this either, although my handlebars seem to be coming slightly loose. I noticed London bike shops don’t seem to sell a full “toolset for cyclists”. I found one during a trip to Amsterdam (along with a cheap padlock) So yes. I have tools. I think I’m ready for some oily brokenness, as any man should be right? Sweatyness. I don’t have shower facilities at work, so I thought this might be a problem, particularly in the summer. But again, not as bad as I had expected. I guess you never really get the heat of the sun at commuting times, and fortunately my route to work is vaguely downhill (cyclestreets.net shows nice altitude profiles too) I change into a fresh T-shirt when I arrive, and hopefully don’t smell much. Bad weather. Will I just be a fair weather cyclist? This also remains to be seen. I wasn’t a fair weather cyclist on the way home last night. In the gathering darkness and rain (and perhaps even a bit of an autumnal cold wind) it felt pretty miserable. It wasn’t even raining hard, but I got absolutely soaked. But I kind of enjoy facing the elements. The rain made me day-dream about kayaking as I cycled along, and I made it home well enough. I guess it gets harder as the weather gets more severe. If it’s too miserable I will give up and take the tube. But let’s not forget the people cramming onto tube carriages would’ve had a fairly crappy journey too. This is the best thing about cycling to work. For most people (millions of people) the commute to work is dead time. Sure you can try to make use of time spent on the tube. I got really organised about making sure I had a good book to read, but even so, the daily drudge of “mind the gap” and “move right down inside the carriage” was really starting to grate. It feels fantastic to have escaped it. Journeys to work feel like a lively and invigorating time now. Not only that, but I can actually get into work in 30 minutes instead of 45! 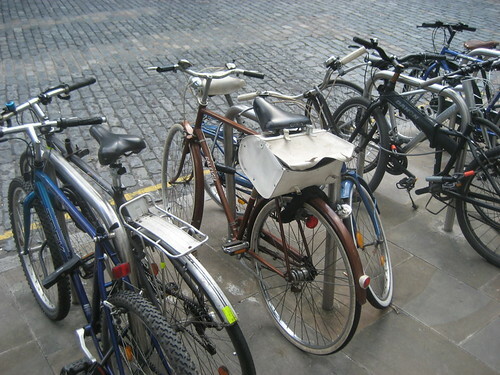 Becoming a London cyclist is a bit of a leap into the unknown, but I now feel stupid for not having tried it earlier.